The Global Volcanism Program has no activity reports for Iriga. The Global Volcanism Program has no Weekly Reports available for Iriga. The Global Volcanism Program has no Bulletin Reports available for Iriga. Mount Iriga (locally known as Mt Asog) is a small andesitic stratovolcano that rises immediately W of Lake Buhi which has satellitic cinder cones of basaltic composition. A large breached crater open to the SE was formed as a result of a major debris avalanche that buried several villages and formed a broad hummocky deposit across the plain south of Lake Buhi. This catastrophic event was at one time considered to have occurred during 1628 CE, but later work has shown that the collapse occurred earlier at some unknown date during the Holocene. An older debris avalanche deposit of similar size was also described SW of the volcano (Paguican et al., 2010). Both debris avalanche deposits cover wide areas of low, waterlogged plains, to a distance of ~16 km for the older and 12 km for the younger. The collapse orientation and deposit constituents for both are consistent with being a response to transtensional faulting and gravity spreading. A cone and lava covering about 9 km2 post-date the younger collapse. Aguila L G, Newhall C G, Miller C D, Listanco E L, 1986. Reconnaissance geology of a large debris avalanche from Iriga volcano, Philippines. Philippine J Volc, 3: 54-72. There is no Deformation History data available for Iriga. There is no Emissions History data available for Iriga. Mount Iriga is a stratovolcano whose most prominent feature is a large horseshoe-shaped caldera that is breached to the SE. It was formed by a massive volcanic landslide during an eruption that at one time was considered to have most likely occurred in 1628 CE, but was later found to have occurred earlier at some unknown time during the Holocene. The hilly terrain in the foreground, encloses small ponds on the surface of the debris-avalanche deposit. 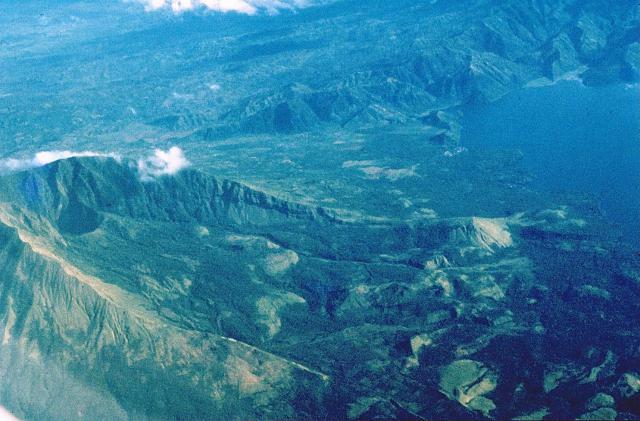 Collapse of the summit and flanks of volcanoes during major volcanic landslides creates large horseshoe-shaped depressions that open in the direction of the landslide. This 2.1 x 3.5 km horseshoe-shaped caldera at Iriga volcano in the Philippines was produced by a massive landslide during the Holocene. The resulting debris avalanche traveled more than 10 km to the SE and flowed into Lake Buhi at the upper right. 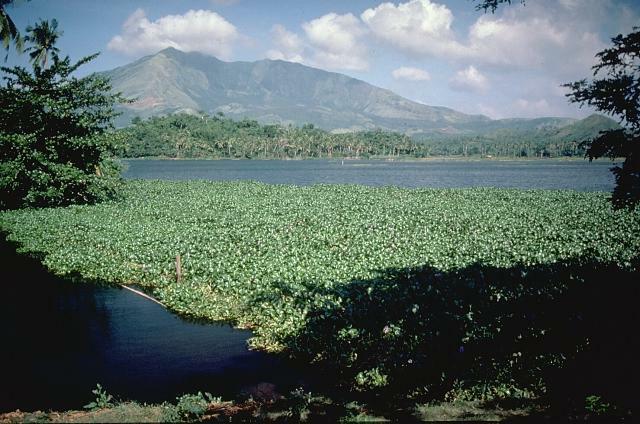 This view is from the south, with the summit of Iriga at the extreme left. The small crater at left-center was formed at the base of the headwall of a massive landslide during an eruption during the Holocene. 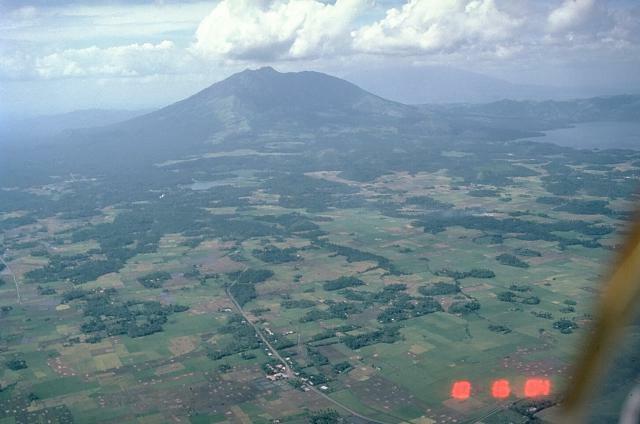 This view looks west into the horseshoe-shaped caldera created during the collapse, with the summit of Iriga in the background. The headwall above the crater is 600 m high. 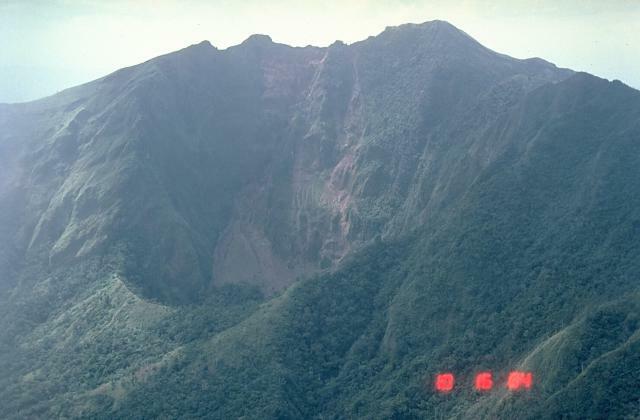 The entire foreground area in this view of Iriga volcano in the Philippines is a massive, 1.5 cu km debris-avalanche deposit formed by a Holocene landslide from Iriga volcano in the Philippines. This view from the SE shows the typical hummocky topography of debris-avalanche deposits. Many of the darker areas are tree-covered hummocks; the irregular topography of the avalanche-deposit also encloses many small ponds. There are no samples for Iriga in the Smithsonian's NMNH Department of Mineral Sciences Rock and Ore collection. Large Eruptions of Iriga Information about large Quaternary eruptions (VEI >= 4) is cataloged in the Large Magnitude Explosive Volcanic Eruptions (LaMEVE) database of the Volcano Global Risk Identification and Analysis Project (VOGRIPA).